Tag: What is the prognosis of monkeypox? Monkeypox is a viral disease that produces pox lesions on the skin and is closely related to smallpox but is not nearly as deadly as smallpox was. The history of monkeypox is new (1958), and the first human cases were diagnosed and differentiated from smallpox in the early 1970s. 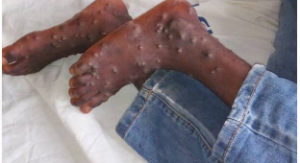 Monkeypox virus causes monkeypox. The majority of cases are transmitted from animals (rodents) to humans by direct contact. Person-to-person transfer, probably by droplets, can occur infrequently. Risk factors for monkeypox include close association with African animals (usually rodents) that have the disease or caring for a patient who has monkeypox. During the first few days, symptoms are nonspecific and include fever, nausea, and malaise. After about four to seven days, lesions (pustules, papules) develop on the face and trunk that ulcerate, crust over, and begin to clear up after about 14-21 days, and lymph nodes enlarge. There may be some scarring. The diagnosis of monkeypox is often made presumptively in Africa by the patient’s history and the exam that shows the pox lesions, however, a definitive diagnosis is made by PCR, ELISA, or Western blotting tests that are usually done by the CDC or some state labs. Definitive diagnosis is important to rule out other possible infectious agents like smallpox. Treatment may consist of immediate vaccination with smallpox vaccine because monkeypox is so closely related to smallpox. Treatment with an antiviral drug or human immune globulin has been done. In general, the prognosis for monkeypox is good to excellent as most patients recover. The prognosis may decrease in immune-compromised patients, and patients with other problems such as malnutrition or lung disease may have a poorer prognosis. Monkeypox are preventable as long as people avoid direct contact with infected animals and people. Vaccination against smallpox seems to afford about an 85% chance of avoiding the infection. There is no commercially available vaccine specifically for monkeypox. Research is ongoing to study antivirals, genetics, and rapid tests for monkeypox. Monkeypox is a relatively rare disease that was first detected in monkeys in Africa in 1958 and resembles smallpox in terms of the skin lesions (pox) seen in humans as part of the physical findings and also because the cause is a virus that is closely related to the smallpox (variola) virus. Monkeypox, smallpox, cowpox, and vaccinia viruses all belong to the same family of viruses, the Poxviridae. Monkeypox belongs to same genus (Orthopoxvirus) as smallpox. The disease is different from smallpox. Monkeypox may be transferred from animals to people (or person to person) and has far less mortality (death rate) than smallpox had. Monkeypox virus is endemic in rodent populations in Africa. Smallpox did not infect any endemic animal population. The press and bloggers have occasionally tried to link monkeypox to other diseases such as mad cow disease, Ebola, leprosy, yellow fever, and other viral and immunological diseases, but there is no scientific evidence. What is the history of monkeypox? Monkeypox has a relatively recent history. It was first discovered in monkeys in 1958, although a “vesicular disease in monkeys” was described in the1860s. The disease, and eventually the causative virus, was named monkeypox because the lesions (pox) seen in monkeys developed like other known pox-forming diseases (pustules that eventually break open, ulcerate, crust over, and some pox form scars in the skin). Later studies showed the “monkeypox” virus was actually sustained endemically in African rodents. It was not until 1970 in Africa (Zaire, now the Democratic Republic of Congo), when a 9-year-old boy (who developed smallpox-like lesions) was the first person to eventually be diagnosed with monkeypox. This situation initially caused concern that smallpox may also have an animal reservoir or endemic population that would make eradication of smallpox impossible. Fortunately, this was not the case because monkeypox was found to be a different species of pox virus, and smallpox was eradicated from the human population by vaccinations in 1979 (currently, only a few research labs have access to smallpox viruses). Monkeypox is now the major Orthopoxvirus that infects humans and fortunately, not frequently. However, vigilance is warranted as there have been several outbreaks of monkeypox since the 1970s. Although most have occurred in Africa (mainly western and central Africa), there was an outbreak in the U.S. in 2003. This apparently happened when an animal distributor either housed or transported monkeypox-infected African rodents (Gambian rats) with prairie dogs that were later purchased as pets, became “sick,” and transmitted the disease to their owners. What causes monkeypox? How is monkeypox transmitted? Monkeypox is caused by an Orthopoxvirus named monkeypox. The viruses are oval brick-shaped viruses that have a lipoprotein layer with tubules or filaments that cover the viral DNA. There are many members of this viral genus, including such species as variola (smallpox), cowpox, buffalopox, camelpox, rabbitpox, and others. Most species infect a particular animal species but occasionally may infect other mammals. Transmission of monkeypox is usually by direct contact with infected animals or possibly by eating poorly cooked meat from an infected rodent or monkey. Cutaneous or mucosal lesions on the infected animals are a likely source of transmission to humans, especially when the human skin is broken due to bites, scratches, or other trauma — are a likely source for virus infection. Person-to-person transfer, probably by infected respiratory droplets, is possible but is not often documented. One study suggested that only about 8%-15% of infections were transmitted person to person among close family members. What are risk factors for monkeypox? Monkeypox is a relatively uncommon disease. Risk factors include animal bites and scratches from infected animals (mainly African rodents or monkeys) or from other rodents (like prairie dogs) that have had contact with African animals infected with the virus. People should avoid eating any meat from such animals is advised. Recent studies have shown that several species of mammals can be infected with monkeypox, even though the species had never been associated with the virus in their normal environment. Person-to-person transfer, although infrequent, can be reduced or prevented by avoiding direct physical contact with the patient and having the patient’s caregivers wear gloves and face masks. What are monkeypox symptoms and signs? The first symptoms that occur are nonspecific — fever, sweating, malaise, and some patients may develop a cough, nausea, and shortness of breath. About two to four days after fever develops, a rash with papules and pustules develops most often on the face and chest, but other body areas may eventually be affected, including mucus membranes inside the nose and mouth. These skin and mucus membrane pox lesions can ulcerate, crust over, and then begin to heal in about 14-21 days. In addition, lymph nodes usually swell during this time. Some pox lesions may become necrotic and destroy sebaceous glands, leaving a depression or pox scar that, with monkeypox, may gradually become less pronounced over a few years. The toxemia that was seen with smallpox is not seen with monkeypox. The history (especially association with rodents or other animals) and physical exam (present of pox lesions) is presumptive evidence for a diagnosis of monkeypox. Caution is advised. Infectious-disease consultants and CDC personnel should be notified because this infection may represent two additional problems. First, in the U.S. or other countries, it may likely indicate an outbreak of monkeypox, and informed health authorities may help to identify the source of the infection and prevent its spread. The second problem is unlikely but far more serious; the early symptoms may represent a biological warfare or terrorist attack with smallpox that is mistakenly identified as monkeypox. Consequently, definitive diagnosis of this viral disease, outside of Africa, and especially in developed countries where monkeypox is not endemic, is urged. Most laboratories do not have the reagents to do this testing, so state labs or the CDC will need to process the samples to establish a definitive diagnosis. These tests are based on detecting antigenic structures (usually from skin or pox samples or occasionally serum) specific to either monkeypox virus or immunoglobulin that reacts with the virus. PCR (polymerase chain reaction), ELISA techniques (enzyme-linked immunosorbent assay), or Western blotting tests (immunoblotting) are the main tests used. What is the treatment for monkeypox? A smallpox vaccination should be administered within two weeks of exposure to monkeypox.Cidofovir (Vistide), an antiviral drug, is suggested for patients with severe, life-threatening symptoms.Vaccinia immune globulin may be used, but efficacy of use has not been documented. For severe symptoms, supportive measures such as mechanical ventilation may rarely be needed. Consultation with an infectious-diseases expert and the CDC is recommended. What is the prognosis of monkeypox? The usual prognosis of patients with monkeypox is good to excellent. Many patients have mild symptoms. However, patients with immune or other compromised health problems (malnutrition, lung problems) may develop complications of secondary bacterial infections, pneumonia, and dehydration. Older estimations of a 10% death rate were published, but in the last 10-15 years, this has been revised to less than 2% of infected individuals, with the worst cases originating from animal-to-human infection, not person to person. Monkeypox can be prevented by avoiding eating or touching animals known to acquire the virus in the wild (mainly African rodents and monkeys). Person-to-person transfer has been documented. Patients who have the disease should physically isolate themselves until all of the pox lesions have healed (lost their crusts), and people who are caring for these patients should use barriers (gloves and face masks) to avoid any direct or droplet contact. Caregivers should obtain a smallpox vaccination (see below). Patients with depressed immune systems and those who are allergic to latex or smallpox vaccine should not get the smallpox vaccine.Anyone else who has been exposed to monkeypox in the past 14 days should get the smallpox vaccine, including children under 1 year of age, pregnantwomen, and people with skin conditions. There is no commercially available vaccine designed specifically for monkeypox. What research is being done on monkeypox? Research is ongoing with monkeypox virus. For example, prairie dogs are being used as animal models to test the effectiveness of vaccinations. Several studies are using animal models to test the effectiveness of several antiviral drugs to reduce or eliminate symptoms in experimental infections. Because of the close relationship of smallpox to monkeypox, genetic comparison and genetic alteration studies are likely to be available in the future, along with more rapid detection tests. Where can people get more information about monkeypox?